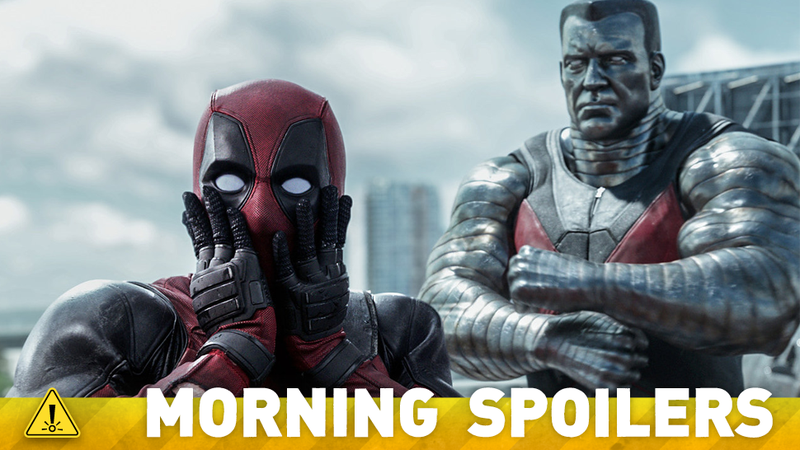 What Are the TWO Mysterious Marvel Movies That Fox Just Started Planning? The Deadpool writers will definitely have a role to play in X-Force. It’s good news and bad news for two Starks on Game of Thrones. George Miller’s involvement with the DC movieverse may have been revealed. Plus, more hope for Young Justice, an X-Men teaser, and clips from Agent Carter’s season finale. To me, my Spoilers! We will have a hand in it. I think everything that ‘Deadpool’ is involved in we will have a hand in and it’s a universe that Ryan [Reynolds] and us are very close to and very protective of, so I do think we would absolutely involved in that franchise as well. If it’s Deadpool related, I think you’ll see some of our fingerprints on that. Robin Atkin Downes has confirmed he has lent his voice to Doomsday for the film. She’s a complex person, and extremely powerful. She doesn’t really understand the depth of her power. I don’t think anyone does. That can make her a frightening character, especially to the government. In this movie, we find her at the beginning of Cap’s tutelage. He’s showing her the ropes as an Avenger. Rumors of Mad Max director George Miller being linked to an involvement with a DC movie—Man of Steel 2 being the primary one—have been around for a while. But it turns out that Miller’s role may not be as front-facing as previously believed. A list of acting auditions casting calls (via Heroic Hollywood) for Justice League Part 1 now lists Miller as a producer on the film—but since there is no official source for this, it’s best to take it as unconfirmed so far. I have a five-film deal with them, and they still have one option […] Thor 3 is not on my slate, but maybe the next Avengers. An Ebay auction claiming to be selling a duffel bag designed for crewmembers on the movie has revealed what appears to be a new design for the Rebel Alliance’s emblem, the Starbird. The Aurebesh on the bag reads “Go Rogue”. Here’s a frighteningly all too realistic faux-political advert for the film’s annual purging premise. Here’s a brief new trailer posted to the movie’s Instagram account. They kill all of us off, so I check at the end of every [script], I’m flicking through, I’m like death, death death – I’m good for this season. Going into season six, she gets broken down totally. We see her at the lowest point we’ve ever seen her. This time it’s nothing to do with a family member being killed, it’s something purely about herself. I love that side of it, and I think this new series, we definitely see a new crack in her. There’s a moment where you question whether she’s going to get back up or keep fighting. I don’t know. That’s the best answer I can give you. I’d be happy to do another one; Greg [Weisman] would be; Phil Bourassa, the character designer. We’d all in a heartbeat come back to do a third season if the Powers-That-Be feel they want to do that. I love that world. We were not done telling stories; we had tons of ideas for more seasons ready to go, so yeah, I’d love to get into it. I think in the larger story, what she did was really still a testament to her friendship and loyalty to Scully. And maybe perhaps in upcoming episodes, which it seems like we’ll be doing, that will be revealed, as to why. Set pictures have confirmed that Alex Kingston will reprise her role as Dinah Lance. Episode 14, directed by former Doctor Who director Alice Troughton, is called “River of Time”. Finally, Peggy holds Jack at gunpoint, and Sousa and Peggy investigate Whitney Frost’s office, in two new clips from the season finale, “Hollywood Ending”. Additional reporting by Gordon Jackson and Charlie Jane Anders. Image: Deadpool.